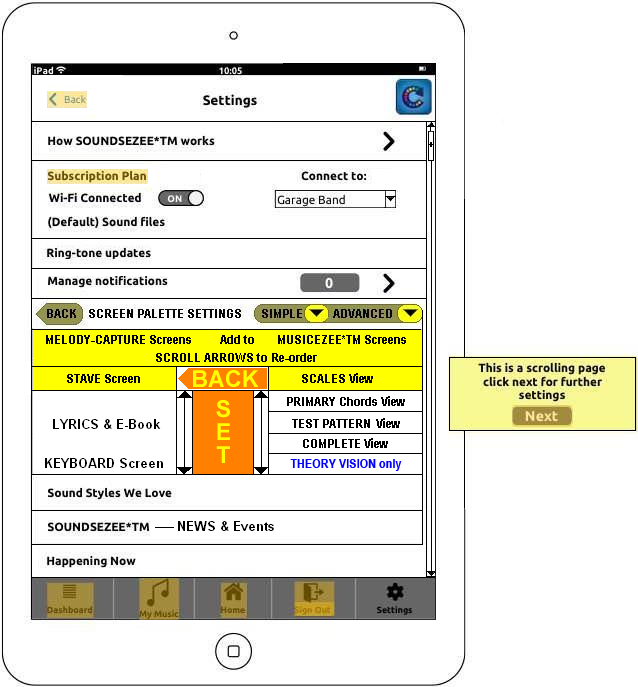 MusicEzee*TM — “makes music easy” —Theory Application firstly — simply TAP on the CHORD Names to display the Chord or Tap on any note to show the Scales or a single Note on the Staves below the Copyright Design as filed Internationally in 14 Countries around the World previously by My Company then called ‘Sound – Principals Pty. Ltd. -© Copyright Paul Callanan 1987–2019. All Rights Reserved. 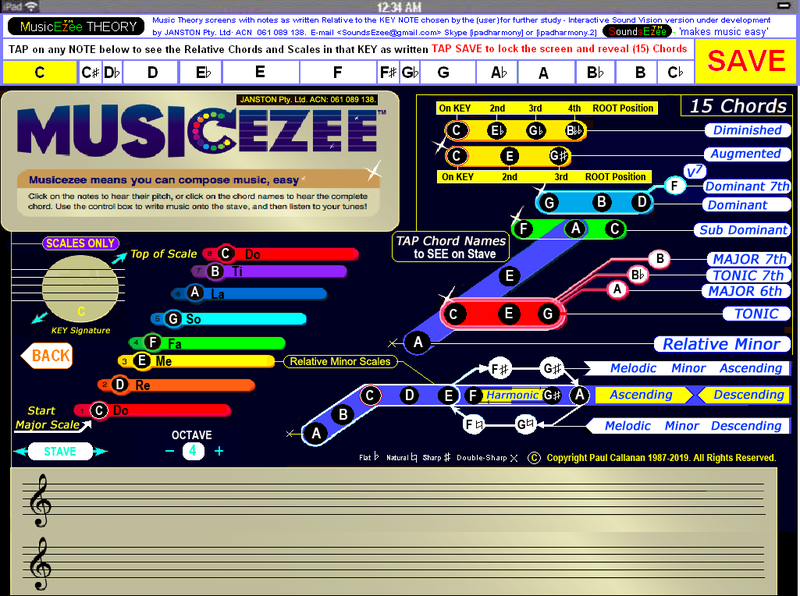 The second release of MusicEzee*TM — https://MusicEzee.weebly.com with the ‘Scientific Interactive Music Palette Application Software’ where you can create Music like an Artist mixes paint on a Palette, being created by JANSTON Pty. 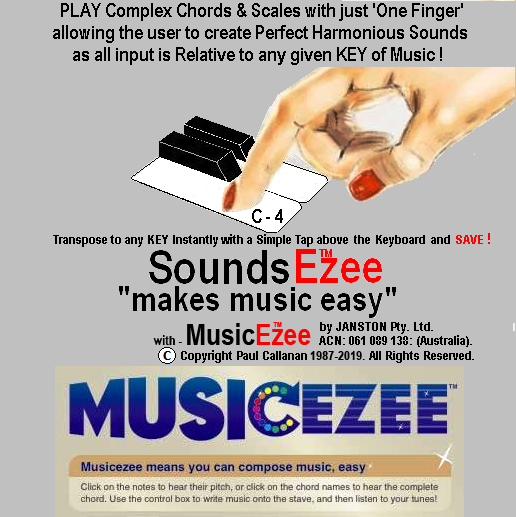 Ltd. combines Music Theory with easy activation SoundsEzee*TM — “makes music easy” Interactive FUN: — https://SoundsEzee.weebly.com with the ‘I-Learn-Music ‘2’ easy’ which will have Music Theory E-Books available for purchase, as well as viewing in Full Screen or Scroll view, via the LYRICS screen where the user can add written Poetry or Lyrics to then add sounds to the words, then transpose to any of the 12 Keys of music at the simple tap of a finger. The first release will be the simple ‘MUSIC THEORY WEB APPLICATION’ — https://MusicEzee.weebly.com has first detail in the Key of [C-4]. Great for Music Therapy! © Copyright Paul Callanan 1987–2019. All Rights Reserved. 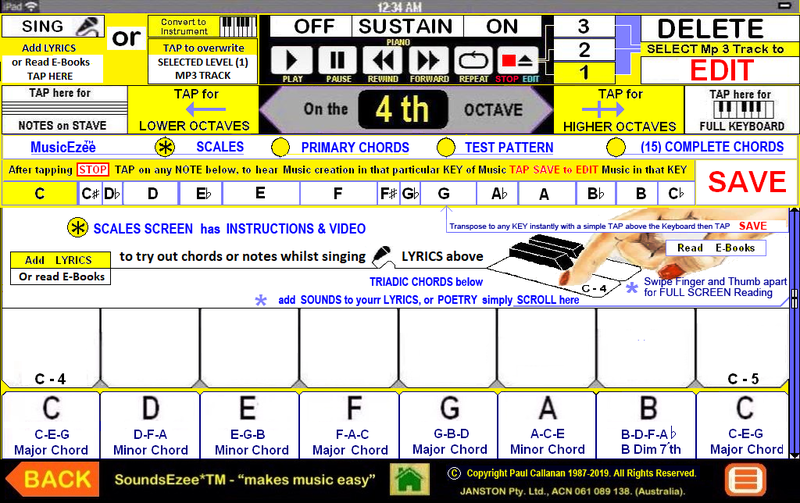 This will be the MUSIC THEORY Application, whereby the notes appear on the Staves as the (user) Taps on Chords or Scales as desired. 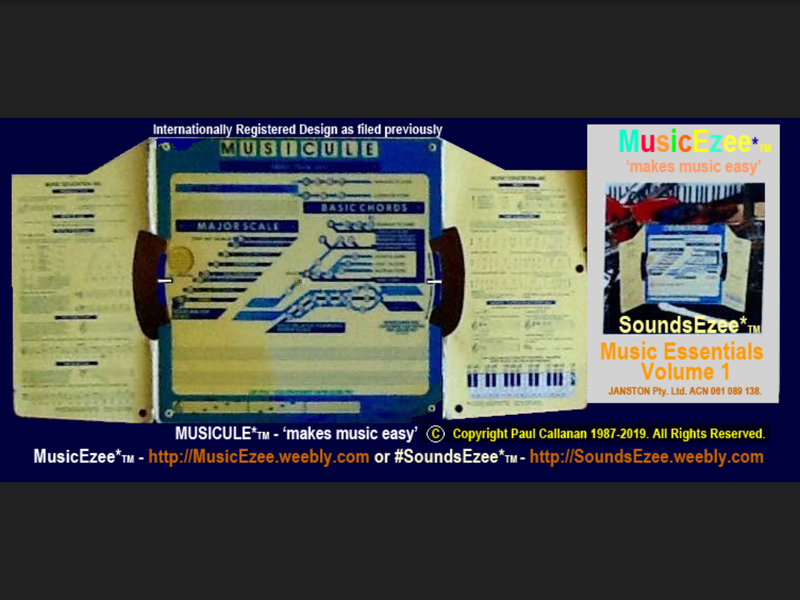 This would be the first release, followed by the fully interactive Music creation Software called MusicEzee*TM — ‘makes #music easy’ — http://MusicEzee.weebly.com — https://youtu.be/UORCGTAt8O8 — © Copyright Paul Callanan 1987–2019. All Rights Reserved. This is just one of (15) fifteen possible BACK function SETTINGS options between the(5) five -MusicEzee*TM Palettes and the (3) three — MELODY-CAPTURE Palettes, which can be Set by the (user), depending on their own level of Musical Prowess, or if they are not interested in Chords and only want to see Major and Minor Scales or MUSIC THEORY without sounds. Anyone can have their own #15MinutesOfFAME in the future with SoundsEzee*TM — http://twitter.com/SoundsEzee © Copyright Paul Callanan 1987–2019. All Rights Reserved. 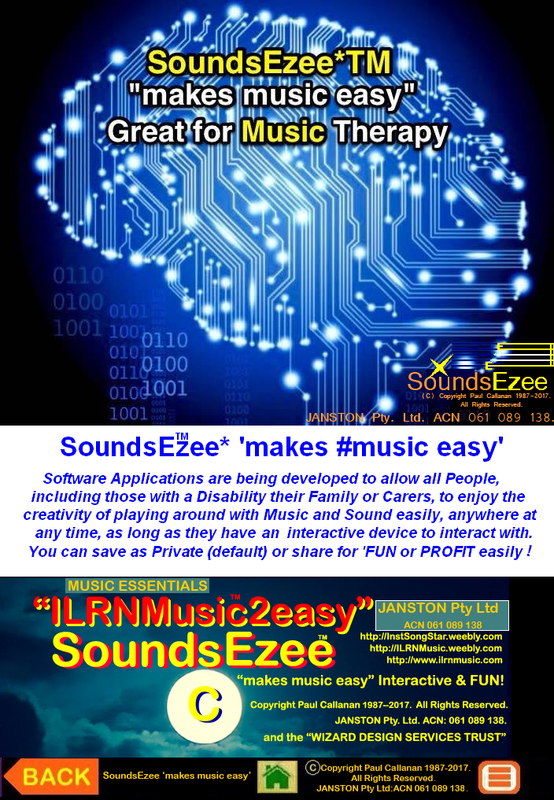 #SoundsEzee*TM ‘makes #music easy’ Interactive FUN! © Copyright Paul Callanan 1987–2019. All Rights Reserved. KEYBOARD Interactive screen view with Triad (3) three note Chords at the base of the screen. © Copyright Paul Callanan 1987–2019. All Rights Reserved. LYRICS and E-Book Reader Screen where you can Write your Poetry or Lyric’s to then add the Sounds to the Words and see what works for You? You can also Read E-Books in FULL -Screen Reading or Kindle view as well as Buy (Licensed Music Books) via the Application, via JANSTON Pty. Ltd. Licensed Publishers or Purchase any E-Book via your AMAZON Account. © Copyright Paul Callanan 1987–2019. All Rights Reserved. STAVE Interactive Screen where Notes will flash onto the screen as activated by the (user), great for Sight Reading of Music as you explore your options of creativity with Sound easily. © Copyright Paul Callanan 1987–2019. All Rights Reserved. MusicEzee*TM — “makes music easy” SCALES Palette, slide fingers over Notes on Scales or TAP individually as required. In the case of the TWO RELATIVE Minor Scales displayed, namely the RELATIVE HARMONIC Minor Scale, you can Play the Scale UP or DOWN by a simple TAP of the Ascending or Descending name tag. With the less popular RELATIVE MELODIC Minor Scale which has TWO paths to create a Harmonious Sound, you simply TAP their White Labels Ascending or Descending to activate all 8 Notes in their structure: _____© Copyright Paul Callanan 1987–2019. All Rights Reserved. 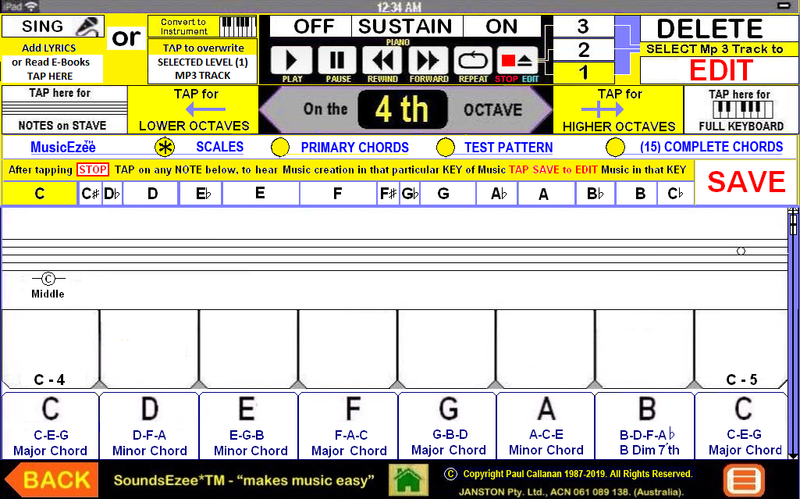 MusicEzee*TM — “makes music easy” PRIMARY CHORDS Palette. Simply TAP on the CHORD Names to play the Chord or Tap on any note to activate a single Note as required. © Copyright Paul Callanan 1987–2019. All Rights Reserved. 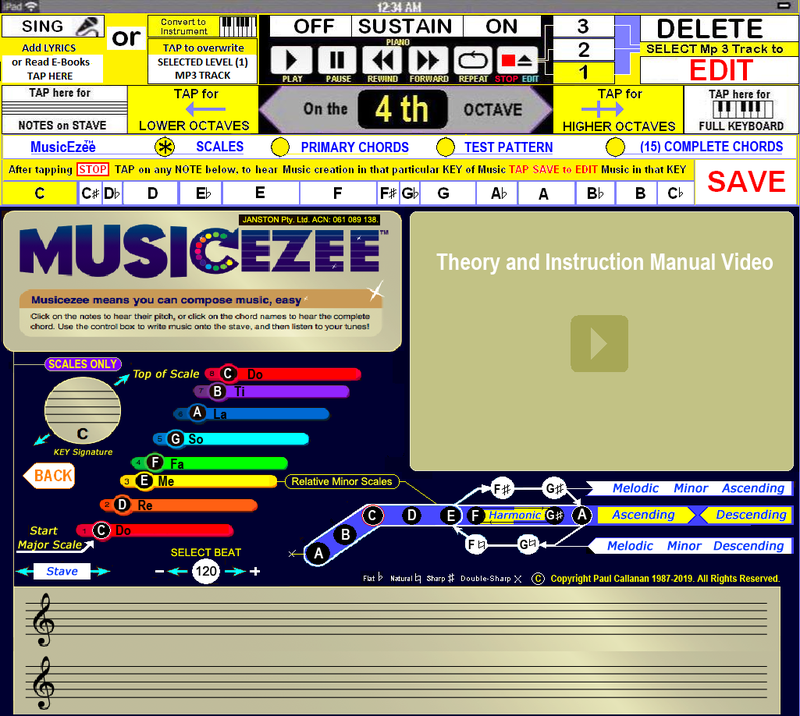 MusicEzee*TM — “makes music easy” ‘TEST PATTERN’ Palette Screen. 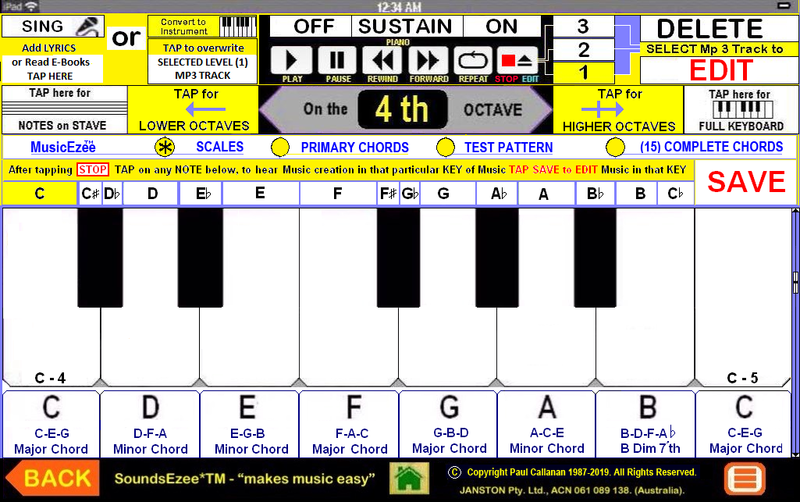 As (users) activate any SCALES or CHORDS with missing TEST NOTES, they in-turn will FLASH on the screen then disappear as set by the (user). This is Great for Music Therapy for Alzheimer’s, Dementia, Stroke Patients, Road Trauma or A.B.I. Patients in Therapy. © Copyright Paul Callanan 1987–2019. All Rights Reserved. 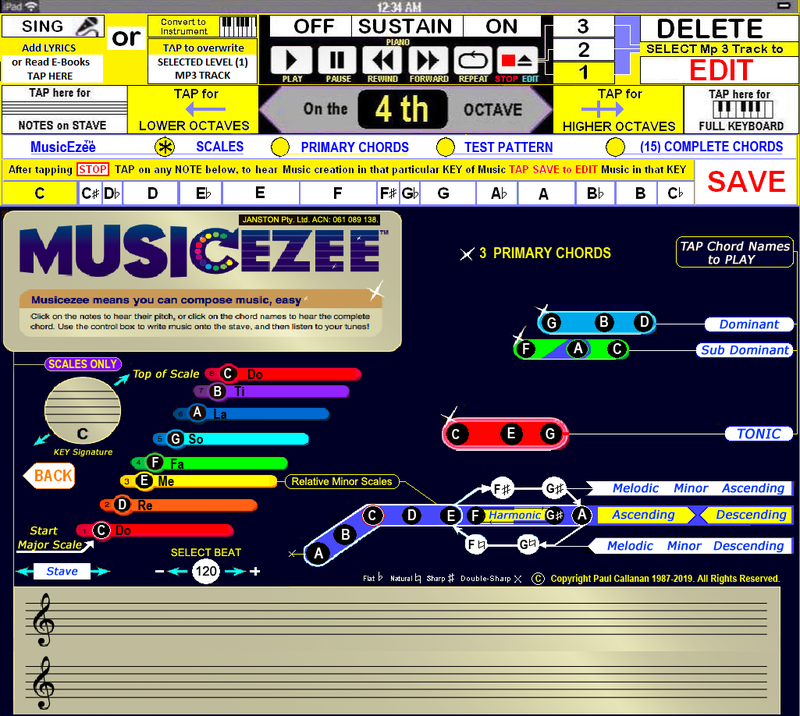 MusicEzee*TM — “makes music easy” Complete “Scientific Interactive Music Palette” for (users) to be able to Play complex Chords at the Tap of a Single finger to the Chord Name. There are (15) fifteen chords shown here, as the Diminished and Augmented are special, as they are equally divided within the OCTAVE. So you have (4) Diminished Chords and (3) three Augmented. © Copyright Paul Callanan 1987–2019. All Rights Reserved. The ‘Original Design’ — the ‘MUSICULE*TM — ‘makes music easy’ Music Calculating device, where at the swipe of a finger you could bring up all 15 KEYS of Music. This has been Internationally Registered at Patent Offices previously. 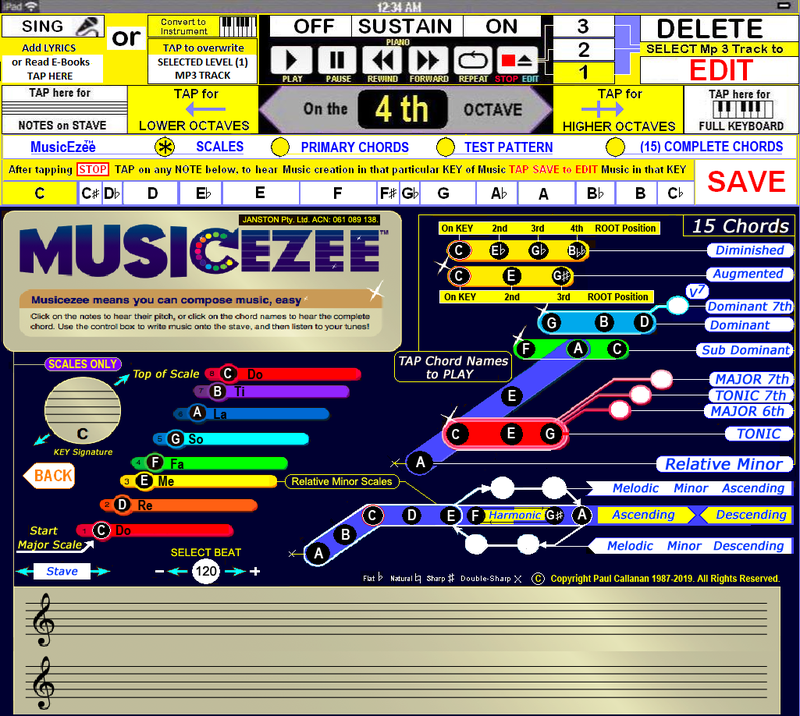 MusicEzee*TM — “makes music easy” Complete “Scientific Interactive Music Palette” for (users) to be able to Play complex Chords at the Tap of a Single finger to the Chord Name. There are (15) fifteen chords shown here, as the Diminished and Augmented are special, as they are equally divided within the OCTAVE. So you have (4) Diminished Chords and (3) three Augmented. © Copyright Paul Callanan 1987–2019. All Rights Reserved. Connect with me on Skype, at [ipadharmony] for first Theory version, or [ ipadharmony.2 ] for the more complete release with Sound and Vision in (iOS) or (Android) in the future development. 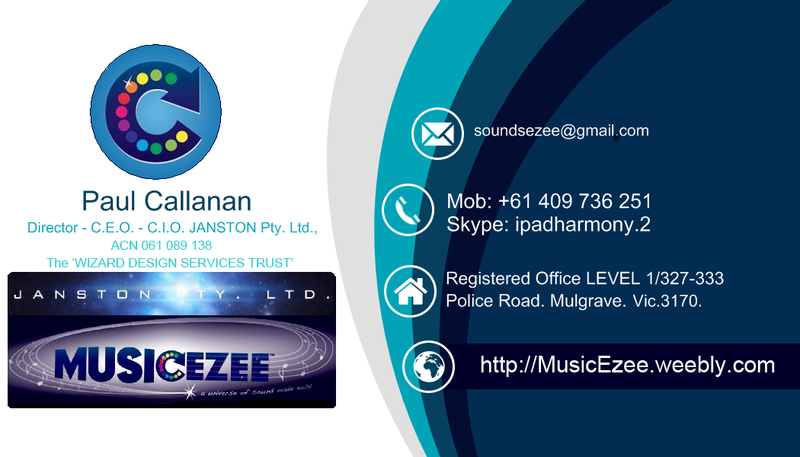 You can E-Mail:< SoundsEzee@gmail.com > to find out more thank you for having a browse. Or Phone +61 0409 736 251 to talk to Paul the Inventor directly. SongStar TM for your "15 Minutes of FAME"
InstSongStar *TM allows all People to Experiment with #Sound and #Music easily"
TuneSomeThing*TM is a 'FACEBOOK' like 'MUSIC UNIVERSAL PLATFORM' for all (users) to enable sharing for (FUN) or (PROFIT) with no fear of © Copyright infringement, as all sold files are protected by a 10% Royalty collected by the 'WIZARD DESIGN SERVICES TRUST'. The (user) can TEST a snippet of a greater work shared on various Music networks for FUN or PROFIT. Also, everyone can imitate any existing Music song, and share in the Music Game Platform 'TuneSomeThing'. The reason there is no fear of © Copyright infringement, is because the 10% is 'Held in ESCROW' by the 'WIZARD DESIGN SERVICES TRUST' which will pay the infringed Royalties paid quarterly in areas, if proven in writing and our Big Data A.I. corresponds to the case. JANSTON Pty. Ltd. is exempt from legal prosecution in these matters as the Royalty is automatically deposited to the 'WIZARD DESIGN SERVICES TRUST' as a purchase take place. 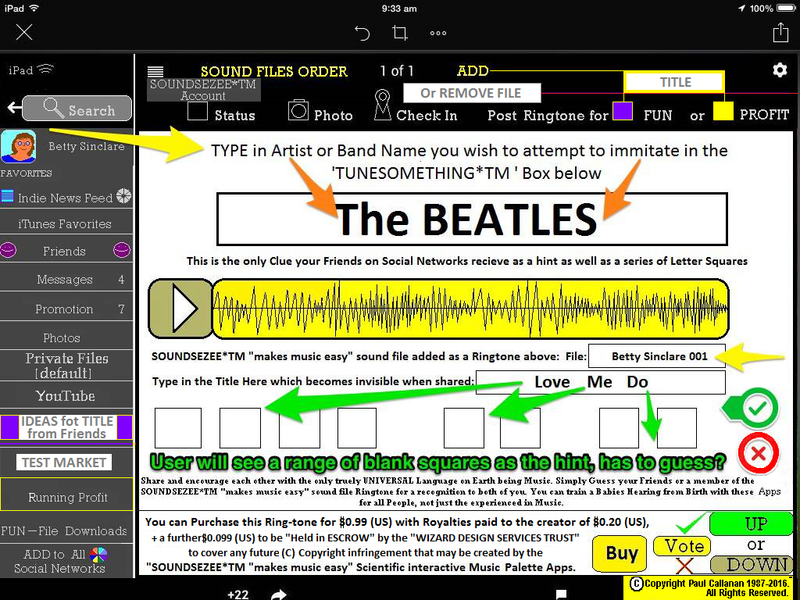 All (users) can TEST a Music Sound file or get ideas for a title of a creation they have made.